Phrases like "those are the little things you do" and "to do that one's little bit" are commonly used by every head coeach in every high-competition sport around the world. In Australian Rules Football, this concept is called "one percenter". The difference to give the 100% effort rather than giving 99% effort in the court lies beyond the mere physical. It represents to apply in every aspect of the career-span of an athlete an unquestionable working ethics, recognized by coaches, teammates, supporters and colleagues. In the AFL the one-percenters are highly respected, such as recently since a couple of seasons ago the "one percenters" are recognized officially as a statistic. Almost always an unselfish action from a player towards his team, those actions who requires that "extra" in the field court. In a previous post I have commented about the Factors Non-Computable with numbers (FNC) that make it impossible to distinguish with certainty when an insufficient statistical contribution is indeed the product of an excellent work without the ball that in numerous occasions decides a game in favor of. The concept of "one percenter" will try to realize that difference. Applied to basketball, the concept of "one percenter" will be every contribution from a player without the ball that's a key factor to decide the situation in favor of his team in a given possession. An offensive "one percenter" must be assigned to every player that, without the ball, makes a offensive effort in order that a teammate makes the possession. 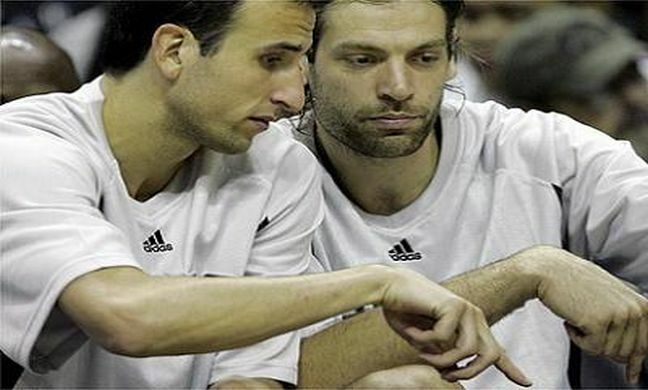 For example, Fabricio Oberto begins a drill dragging one or more markers in order that Emanuel Ginobili performs his typical left-side penetration. Oberto in that case should receive a "one percenter" for that cut. Only one "one percenter" should be granted to a player per team per possession made; if two or more players deserve that statistic, the player who made the best contribution without the ball will be favored with it. We understand as a possession made a field goal made, or at least a free throw made, not a continued possession. The player who receives the offensive "one percenter" should touch the ball without any problem. The only requirement is that player should not materialize the possession. In the same way, a defensive "one percenter" is awarded to a defensive team player who made a key role without the ball that causes a teammate regain the possession. Lastly, a "one percenter" must not be awarded to any player who makes the possession in offense or regains the possession in defense. For this purpose, there are the traditional stats. In offense, if a player was instrumental in a static and scores a 3-pointer, the player is not scoring a one-percenter but a 3-pointer instead. Similarly in defense, if a player was the key to retrieve the ball for his team, and he recovered it, he doesn't receive a "one percenter" but directly a steal.